So, the Nokia 700 is small. It's in no mood though to lie low and wait for the Windows Phones to foot the bill. No sir, the Nokia 700 will earn its keep. While Nokia are still honeymooning with Microsoft, it's good old Symbian holding the fort. Two things. It's good old Symbian but not quite. Forget about old. Since Belle, the OS is no longer living in the past. Secondly, the Nokia 700 is small in stature only. Full of character. The Belle update is to Symbian what a reboot is to a PC that’s been acting up. Fluid and efficient, the OS is more than the sum of its parts. With a proper notification area, flat menu structure and better handling of widgets, Symbian Belle won’t be embarrassed anymore by comparisons with Android. It’s the good looks and the overall feel though that make a massive difference. And the best thing is users get to enjoy a vastly improved experience on one of the most beautiful phones Nokia ever made. Fast ticking, good looking and built to near perfection, the Nokia 700 is the first Symbian handset in quite a while we are downright impressed with. There are things we didn’t like but we don’t think they ruin the overall good impression. The camera is bad enough to be chalked down to a faulty unit. Screen size is an issue too. For all its brilliant image quality, the ClearBlack AMOLED touchscreen isn’t big enough for comfortable typing. 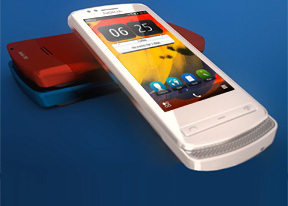 There’re still plenty of arguments in favor of the Nokia 700. Free lifetime navigation and a solid connectivity package complete with NFC will let the 1GHz smartphone give its best shot against Android competition. HTC have the Facebook-centric Salsa and the likeable Wildfire S. The heavily-accessorized HTC Rhyme looks set to speed past them on a 1GHz CPU but it probably is in a different niche altogether with a 3.7” screen. This is where Sony Ericsson come in with a closer match. The Live with Walkman and the Xperia mini are small but capable Snapdragon-powered smartphones. As always though, it’s a great rivalry that makes the game really exciting. This is not your usual brawl between similarly spec’d phones. It’s a beauty contest too, which the brilliant Sony Ericsson Xperia ray and the Nokia 700 have equal chance to win. It's been a while since we've been able to wholeheartedly recommend a Symbian phone as an alternative to a droid. There’s something about the Nokia 700 for sure. A piece of Nordic beauty, a job well done.